J.Robert Scott. US Patents for outstanding American “Ombre” Laquered furniture, & glamourous leather sofas in a unique colour palette. Richard Chilcott at J.Robert Scott showed us a fabulous collection of “Ombre” shaded lacquered furniture, and interiors for apartments & airplanes. Careful preparation of the maplewood surfaces to be lacquered & the selection of a Pantone tint for the eventual colour, the US patented process for “Ombre” takes 16 weeks to produce the finished product. With a factory in Los Angeles, this is American expertise at its best. Richard Chilcott showed us a range of precious, great to handle, fabrics in a palette of Beiges moving to Greys, GREIGE. Applications from Classic to Contemporary. Strictly exquisite American Luxury.home furnishings. J.Robert Scott has a sensational selection of colours for their super soft super kid leather, one of their best selling ranges, used for occasional seats & glamourous sofas. 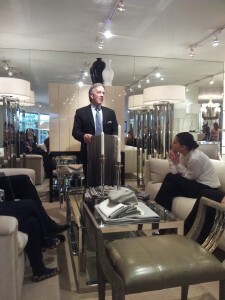 J.Robert Scott famous for their sleek furniture Made In America. London Design Week, Chelsea Harbour.